'Summertime' is a single storey house facing south and looking out over the sea and the Isles de Levant. It is extremely secluded as the only way in from the road is via the front door! All rooms except the third bedroom lead out onto one of the two terraces with their spectacular views, and there are paths leading down from each terrace to the coastal path and the rocks below, then it is is two minutes to the golden sandy beach of St. Clair. The third bedroom has a single bed that can be expanded to a double bed, but as this room is small this will result in a restriction of space around the bed. There is wifi in the house for those wanting to bring computers etc. There is a dining area on the west terrace. Garden chairs, loungers and a baby's cot are available. Extra cleaning may be available on request. The old fishing port of Le Lavandou is 5 minutes walk away, abounding with restaurants, charcuteries, poissoneries, delicatessens, and fishermen . Or you could just sit outside one of the cafe/bars facing the sea in the sunshine, and watch the French enjoy their never ending game of Boules. When you are in Summertime you leave the rest of the world behind. Just you and the view. You can swim off the rocks below in the frequent calm weather. If you want or need to visit a shop or restaurant you will find them within easy walking distance. For the more active there are bikes to hire in Le Lavandou and plenty of watersports at Le Lavandou or nearby Cavaliere. Right above the sea - easy walk to beaches, shops, restaurants - sleep to the sound of the waves lapping - relax on one of the many terraces with a book and something cold to drink. Le Lavandou, with its boulangeries, supermarkets, restaurants, cafes, boules areas and bars is just a short five minute walk from the house. St Clair beach with its beach restaurants, seaside shops and cafes is a two minute walk either along the cliff path or the road on a wide pavement. You do not need to cross a road. It is easy to access the water below the house. Spectacular views to the ocean are visible from every room except the WC and the small bedroom at the back of the property. Well it is the Mediterranean Sea rather than an ocean. It is possible to access the sea on calm days from the rocks below the house. There is a small concrete platform. Jelly shoes are advised. No extra charge for electricity or linen. The house is all one level once you have gone down the steps from the car port.. There is a hot and cold shower on the back terrace. Thank you Simon. We are so glad you had another happy holiday at Summertime. Spectacular view and great location. This was our third stay at Summertime and we enjoyed it very much. 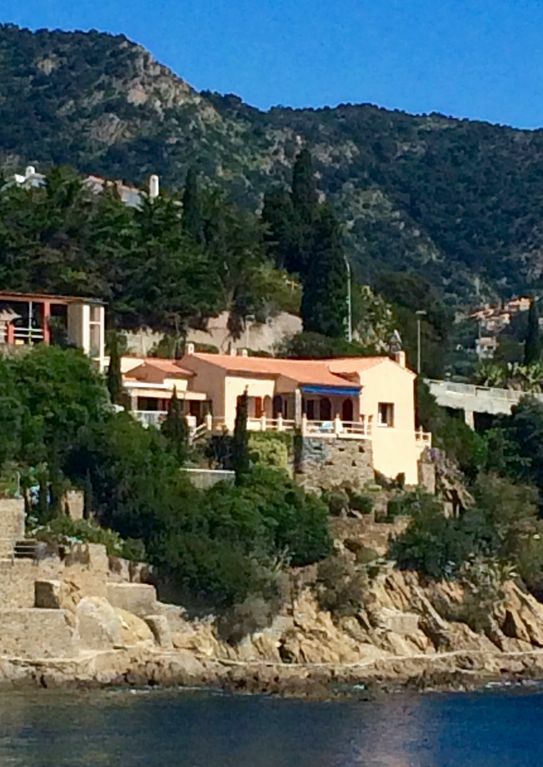 The location is great since it feels very secluded on a beautiful part of the French Riviera, but is within 15 minutes walking distance to the centre of Le Lavandou or 10 minutes to St Claire beach and restaurants. Thank you for this wonderful review. Thanks particularly for mentioning how secluded you feel as that is no obvious from the photographs and something people often ask about. My mother and I are so glad you had an enjoyable holiday and wish you a safe onward journey. The structure of the house is charming, views across numerous windows and doors are wonderful, and it is very easy to go from one side to the other of the house. Lovely floors, good furniture... 4 terraces are ideally located in order to enjoy every moment of the day and night! It was very clean... the only thing to improve would be to inform us when the house was ready (we were waiting and have lost a part of the first day like this... as it was said we would have a possibility to arrive early... and at 4pm we were still waiting for an answer ( that we had never received beside) - Tricia was very helpful from her home by email... but the local service could be improved by not forgeting to inform the guest when it is ready! We are now looking forward to coming back! thank you ! Thank you very much for taking the time to write a review. My mother and I are so glad that you enjoyed your stay. However we were very sorry and disappointed to hear about the delay you had getting into the house. I have spoken to the cleaners who apologised for not calling you when they had finished. They said they had 15 clients that day and just forgot. Not an excuse but a reason. Next time I will give you a number to ring so this cannot happen again. Wonderful stay. Even though it was early April it's such a sun trap we spent many a day on the balconies basking with local wine, cheese and culinary delights. Cant recommend enough! Thank you Sam! So glad you enjoyed yourselves. Having been several times before with family, I booked Summertime for a long weekend in March for my boyfriend's birthday. It's an incredibly special place - the views are breathtaking - and he was blown away by it. We hired a car and drove from Marseille Airport via Cassis - definitely worth a pitstop if you have time to take the scenic route. During our stay, we made a few trips into Le Lavandou (easily walkable) and drove to beautiful Bormes, but best of all was soaking up the sun and sea air on the terrace and navigating the cliff path (accessible from the house) to the sandy beach at St Clair. It was the first time I'd been to Summertime not in the summertime (!) and while we did have a dramatic and very picturesque thunderstorm one night, the days were sunny and warm. It was also wonderful to be there off-season and to get a flavour for local Provencal life. The market in Le Lav is second-to-none and we loved people watching and following the endless games of boules. There are a few great restaurants at St Clair, but it's well worth making the longer walk (or swim if you're feeling fit) to La Fosette for the infamous moules marinieres. Special thanks to Tricia for all of her help and organisation, and to Nicola for making the house spotless and cosy for our arrival. Thank you Lucy H! We are so glad you enjoyed your stay. Thanks also for filling in more details which will benefit future tenants. Golf: Golf de Valcros: Telephone: +33 (0)4 94 66 81 02. Fax: +33 (0)4 94 35 03 73, 18 holes. The course is situated between St Tropez and Toulon, and faces south west, sheltered by trees and beside a river, with superb views of the hills. It was established in 1964 and has built a solid reputation both near and far. The course demands technique and precision, and golfers will always find their abilities stretched. License and handicap (35 maximum) essential. There is a swimming pool in the golf facilities. It really is the most beautiful area.